BACKGROUND AND PURPOSE: Histopathologic grade of glial tumors is inversely correlated with the minimum apparent diffusion coefficient (ADC). We assessed the diagnostic values of minimum ADC for preoperative grading of supratentorial astrocytomas that were diagnosed as low-grade astrocytomas on conventional MR imaging. MATERIALS AND METHODS: Among 118 patients with astrocytomas (WHO grades II–IV), 16 who showed typical MR imaging findings of low-grade supratentorial astrocytomas on conventional MR imaging were included. All 16 patients underwent preoperative MR imaging and diffusion-weighted imaging. The minimum ADC value of each tumor was determined from several regions of interest in the tumor on ADC maps. To assess the relationship between the minimum ADC and tumor grade, we performed the Mann-Whitney U test. A receiver operating characteristic (ROC) analysis was used to determine the cutoff value of the minimum ADC that had the best combination of sensitivity and specificity for distinguishing low- and high-grade astrocytomas. RESULTS: Eight of the 16 patients (50%) were confirmed as having high-grade astrocytomas (WHO grades III and IV), and the other 8 patients were confirmed as having low-grade astrocytomas (WHO grade II). The median minimum ADC of the high-grade astrocytoma (1.035 × 10−3 mm2 · sec−1) group was significantly lower than that of the low-grade astrocytoma group (1.19 × 10−3 mm2 · sec−1) (P = .021). According to the ROC analysis, the cutoff value of 1.055 × 10−3 mm2 · sec−1 for the minimum ADC generated the best combination of sensitivity (87.5%) and specificity (79%) (P = .021). CONCLUSION: Measuring minimum ADC can provide valuable diagnostic information for the preoperative grading of presumptive low-grade supratentorial astrocytomas. Despite aggressive treatments, overall prognosis of high-grade astrocytomas, especially glioblastomas, is still poor, mainly due to their infiltrative nature and high relapse rate compared with those of low-grade astrocytomas.1–4 Accurate preoperative grading of a brain tumor is thus pivotal in choosing the treatment strategy and in the assessment of prognosis. 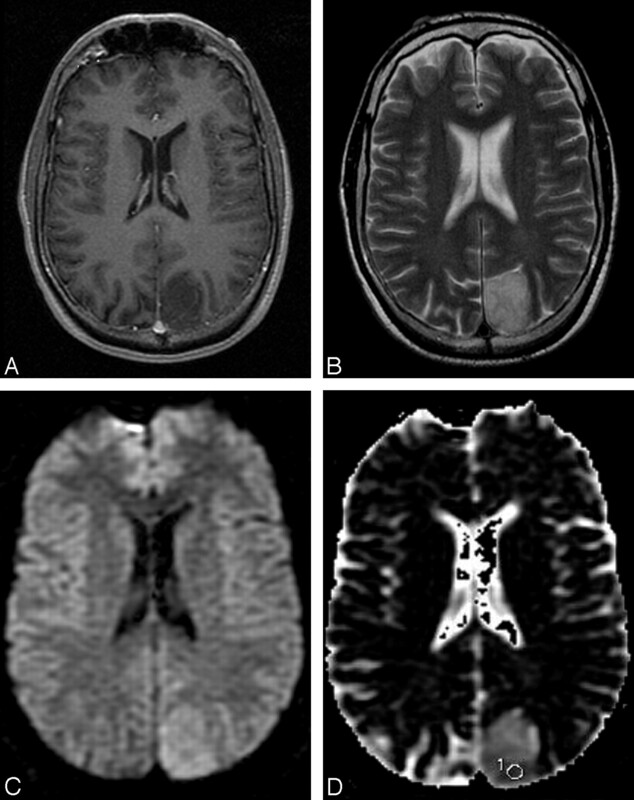 On conventional MR imaging, malignant gliomas usually show strong contrast enhancement, peritumoral edema, mass effects, heterogeneity, central necrosis, and intratumoral hemorrhage. The typical MR imaging features of low-grade astrocytomas include a relatively well-defined usually homogeneous mass that displays little or no mass effect, with minimal or no vasogenic edema and little or no enhancement after contrast administration.5–7 Nevertheless, it is not always easy to differentiate low-grade astrocytomas from high-grade ones on the basis of conventional MR imaging findings. It has been reported that high-grade and low-grade astrocytomas can have overlapping features on MR imaging.2,8–12 Recently, it was shown that the histopathologic grade of glial tumors is inversely correlated with the minimum apparent diffusion coefficient (ADC).1,3,9,13,14 Thus, we hypothesized that a high-grade astrocytoma may demonstrate a lower minimum ADC value even though it shows the typical MR imaging features of low-grade gliomas. The purpose of this study was to evaluate the diagnostic value of the minimum ADC for preoperative histopathologic grading in supratentorial astrocytomas that showed typical features of low-grade astrocytomas on conventional MR imaging. This study was reviewed and approved by the institutional review board. Among 507 adult patients with brain tumor who underwent neurosurgical exploration at our institution between January 2004 and June 2006, 118 were diagnosed as having WHO grades II–IV astrocytomas. These included 107 high-grade astrocytomas (92 glioblastomas [WHO grade IV] and 15 anaplastic astrocytomas [WHO grade III]) and 11 low-grade astrocytomas (diffuse astrocytomas [WHO grade II]). All histopathologic diagnoses were determined on the basis of surgical specimens according to the WHO criteria, and no stereotactic biopsy was used. We retrospectively reviewed 118 patients’ preoperative MR imaging examinations to identify those who showed typical findings of low-grade glioma. 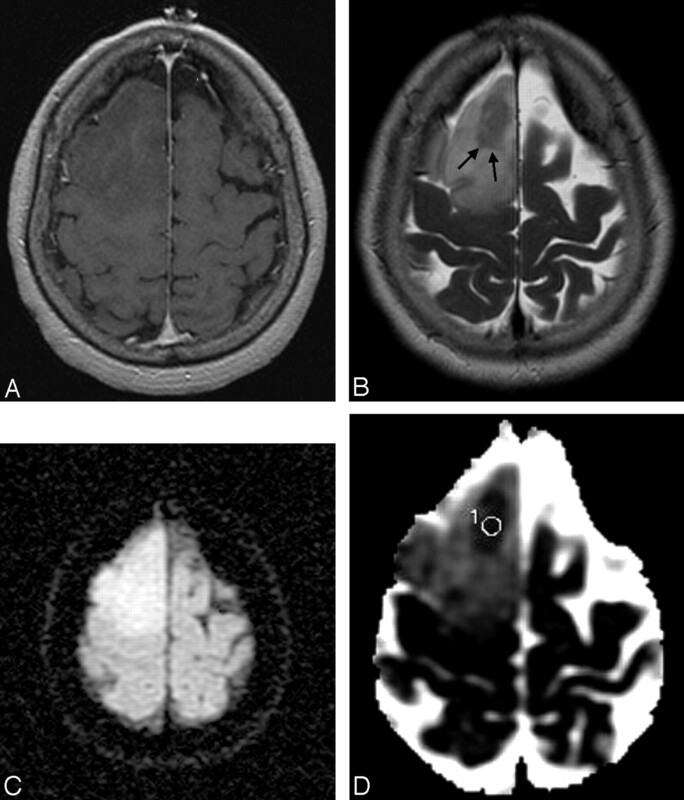 All preoperative MR imaging examinations included diffusion-weighted imaging (DWI). Typical conventional MR imaging findings of low-grade gliomas were defined as relatively well-marginated usually homogeneous tumors that displayed little or no mass effect with minimal or no vasogenic edema and little or no enhancement after contrast administration. We excluded patients with mixed gliomas, those with infratentorial astrocytomas that prevented accurate ADC analysis, and those who had undergone any major therapeutic intervention before MR imaging. In addition, patients who underwent surgery >1 month after the preoperative MR imaging examination were also excluded. Sixteen patients met our inclusion criteria (8 men and 8 women). Their ages ranged from 21 to 77 years (median age, 42 years). In all except 1 patient, MR imaging was performed on the day of surgery; 1 patient underwent MR imaging 1 day before surgery. The preoperative MR imaging diagnosis of all the included patients was low-grade glioma (WHO grade II astrocytoma). All MR imaging examinations were performed with a 1.5T MR imaging system (Signa EchoSpeed, Version 8.2.3 software; GE Healthcare, Milwaukee, Wis) with a standard head coil. Conventional MR images included fluid-attenuated inversion recovery imaging (TR/TE/TI, 9000/165/2200 ms; number of signals acquired, 1; section thickness, 5 mm; intersection gap, 2 mm; matrix size, 256 × 192; FOV, 22.0 × 22.0 cm), T1-weighted (TR/TE 450/20 ms; number of signals acquired, 1; section thickness, 5 mm; intersection gap, 2 mm; matrix size, 256 × 224; FOV, 21.9 × 21.9 cm), T2-weighted (TR/TE, 4250/93 ms; number of signals acquired, 1; section thickness, 5 mm; intersection gap, 2 mm; matrix size, 256 × 256; FOV, 21.9 × 21.9 cm), and contrast-enhanced T1-weighted images as well as DWIs. The DWIs were acquired in the transverse plane by using a spin-echo echo-planar sequence with diffusion gradient encoding in 3 orthogonal directions (TR/TE, 11,000/59 ms; number of signals acquired, 1; section thickness, 5 mm; intersection gap, 0; matrix size, 128 × 128; FOV, 29.9 × 29.9 cm) with 3 orthogonal directional motion-probing gradients (b = 1000 s/mm2), followed by the automatic generation of isotropic DWI. Images without motion-probing gradients (b = 0 s/mm2) were obtained simultaneously. The ADC maps were calculated from isotropic DWI, and images were obtained with a b-value of 0 s/mm2. The minimum ADC of each tumor was determined by placing regions of interest using an Advantage Workstation (GE Healthcare) by 1 neuroradiologist without knowledge of the histologic grade. All continuous sections of ADC maps that included tumor were evaluated. When the mass had a relatively larger low ADC area on visual inspection, 5–6 round or oval regions of interest were carefully placed on each selected section of the ADC map. If the low ADC area was relatively small, we used 2–3 regions of interest to measure the ADC value of the lesion. In all cases, the area of each region of interest was 40 mm2, and each region of interest was positioned carefully to avoid contamination from adjacent tissues. The region of interest with the lowest ADC value was chosen from these regions of interest as the minimum ADC of the tumor. To analyze the minimum ADC values observed in different astrocytomas, we classified the tumors into 2 groups: low-grade astrocytomas (WHO grade II) as group A and high-grade astrocytomas (WHO grades III and IV) as group B. To assess the relationship between the minimum ADC and tumor grade, we analyzed the minimum ADC in the 2 groups by using the Mann-Whitney U test. Moreover, we assessed the relationship between patients’ ages and tumor grade in both groups. A P value < .05 indicated a statistically significant difference. A receiver operating characteristic (ROC) analysis was used to determine the cutoff value of the minimum ADC that had the best combination of sensitivity and specificity for differentiating the low-grade from the high-grade astrocytomas. Among 118 patients with pathologically confirmed astrocytomas, 107 (107/118, 90.7%) were diagnosed as having high-grade astrocytomas (WHO grades III and IV) and 11 (11/118, 9.3%) with low-grade astrocytomas (WHO grade II). Sixteen patients who had the preoperative MR imaging diagnosis of low-grade astrocytoma were included in this study. Among those 16 patients, the histopathologic diagnosis of 8 patients was low-grade astrocytoma (group A, 8/11, 77%) and that of the other 8 patients was high-grade astrocytoma (group B, 8/107, 7.5%). There were 6 patients (6/8, 75%) with anaplastic astrocytomas (WHO grade III) and 2 (2/8, 25%) with glioblastoma multiforme (WHO grade IV) in the group A patients. All group B patients had diffuse astrocytomas (WHO grade II). Table 1 summarizes the histopathology of the 16 patients. The median minimum ADC (1.035 × 10−3 mm2 · sec−1) for group B was significantly lower than that for group A (1.19 × 10−3 mm2 · sec−1) (P = .021), though some overlap of distribution was shown between the values of the 2 groups (Table 2 and Figs 1–3). There was no statistically significant age difference between the 2 patient groups (Table 2) (P = .529). 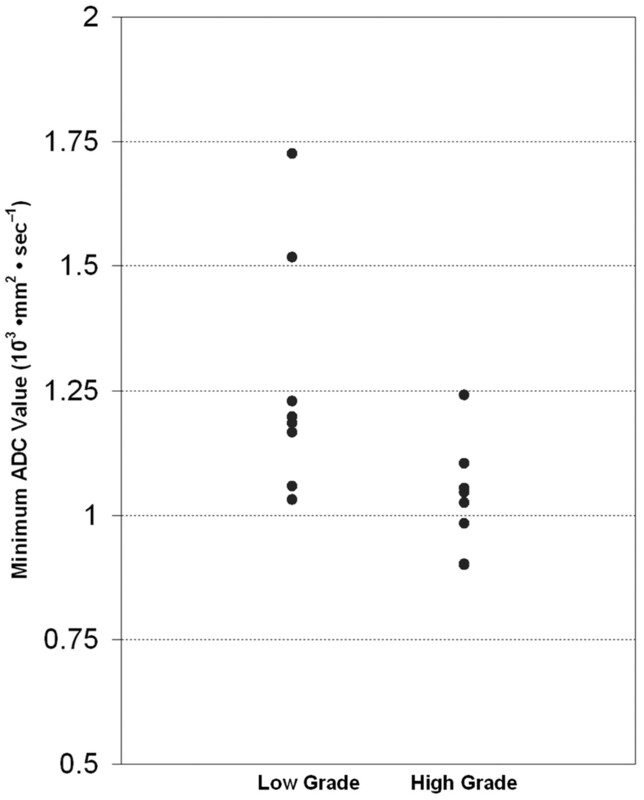 Relationship between minimum ADC and grading of astrocytic tumors. Minimum ADC values (10−3 mm2 · sec−1) of low-grade astrocytomas are higher that those of high-grade astrocytomas, though some overlap is noted (P = .021). A 44-year-old man with an anaplastic astrocytoma. A, Contrast-enhanced T1-weighted image shows a nonenhancing mass in the right frontal lobe. B, The mass shows increased signal intensity in the T2-weighted image with a focal hypointense area (arrows). C, On the DWI, the mass has relatively homogeneous increased signal intensity. D, The ADC map shows increased ADC with a region of interest placed in the focal area of low ADC within the mass. The lesion area has a minimum ADC of 0.902 × 10−3 mm2 · sec−1. A 44-year-old man with a grade II diffuse astrocytoma. A, The contrast-enhanced T1-weighted image shows a nonenhancing mass in the left parietal lobe. B, The mass has relatively homogeneous increased signal intensity in the T2-weighted image. C, The DWI shows increased signal intensities compared with the surrounding regions. D, The ADC map shows high a ADC value compared with surrounding brain parenchyma with a subtle low ADC area with a region of interest placed for the lowest ADC measurement. The measured minimum ADC within the mass is 1.185 × 10−3 mm2 · sec−1. High ADC values in intracranial tumors are attributed to low tumor cellularity, necrosis, or cysts, and lower values are attributed to attenuated highly cellular tumors.3 Indeed, several studies have found higher ADC values in low-grade gliomas than in high-grade gliomas.2,3,9,13,14,19,20 These higher ADC values in lower grade gliomas may reflect an increase in the water content of the interstitial spaces. Therefore, brain neoplasms with higher cellularity or of higher grade show a significant reduction in their ADC values and markedly increased signal intensity on DWI. Yamasaki et al13 suggested an inverse relationship between the mean ADC and astrocytic tumors of WHO grades II–IV. Most of the published studies to date evaluated the diffusion properties in various pathologic types of tumors, rather than in a single type of tumor. We compared the ADC of diffuse astrocytic tumors (WHO grades II–IV), which have little mass effect, vasogenic edema, heterogeneity, hemorrhage/necrosis, or contrast enhancement on conventional MR imaging. We found a significant difference in the median minimum value for differentiating the low- and high-grade astrocytomas, though the minimum ADC of each group overlapped (P = .021). These results agree with those of previous reports. The cutoff value of 1.055 (10−3 mm2 · sec−1) for the minimum ADC provided the best combination of sensitivity (87.5%) and specificity (79%) for differentiating tumor grades (P = .021). Fan et al12 evaluated the utility of DWI in patients with nonenhancing supratentorial brain gliomas. They also found that ADC values calculated from the tumor core were helpful in differentiating and grading nonenhancing gliomas, but their subjects included patients having tumors with heterogeneous signal intensity and clear evidence of central necrosis on conventional MR imaging. Therefore, their subjects differed from those in our study. Studies by Rollin et al10 and Lam et al21 failed to find a significant difference between the ADC values of high-grade and low-grade gliomas, and some studies have shown that tumor minimum ADC values have preoperative prognostic importance in patients with malignant supratentorial astrocytomas.4,22,23 In addition, Barker et al15 and Scott et al16 demonstrated that the risk of anaplasia in nonenhancing cerebral tumors increases with age, whereas we did not find any difference between the ages of the patients with high- and low-grade astrocytomas. Furthermore, measuring the lowest ADC within a tumor might aid in selecting an appropriate site for a stereotactic biopsy. Because gliomas are typically heterogeneous and can have different histopathologic grades within a single tumor, choosing a biopsy site on the basis of conventional MR imaging findings may not lead to an accurate estimation of tumor grade or appropriate establishment of the optimum treatment strategy. On the basis of our results, we believe that performing stereotactic biopsy at the lowest ADC area of the glioma might be helpful to establish a correct grading of patients with intracranial glioma. One limitation of this study is that the histologic specimens did not necessarily come from the sites where the minimum ADC was measured. A given individual glioma, usually of high grade, often contains a continuum of histologic features of grades II–IV. Therefore, the range of ADC values within a given glioma can vary markedly.1,3 Thus, ideally, gliomas should be graded by using specimens from their most malignant portion.3 Although we included only the minimum ADC value measurements to sample the highest tumor cell attenuation or the most proliferative portion of the tumor, there still is potential mismatch between ADC measurements and histopathologic specimens. Another limitation of this study is that our sample size was small. The size was inherent to our inclusion criteria and restricted the study to only 7.5% of all patients with high-grade gliomas. Conventional MR imaging findings of typical low-grade glioma may not always be reliable for grading brain astrocytomas. In this study, we have demonstrated an inverse correlation between the minimum ADC value and histopathologic grade of astrocytic tumors. We believe that the lowest ADC measurement can provide valuable additional information for accurate preoperative grading of astrocytomas.